Britain needs an industrial strategy. At the same time, Britain needs to move away from its imperial pretensions to police the world's oceans. The two factors are ever more interlinked. House destroyed in airstrikes by the Saudi-led coalition in Sanaa, Yemen, on Dec. 29, 2017. Mohammed Mohammed/ Press Association. All rights reserved. 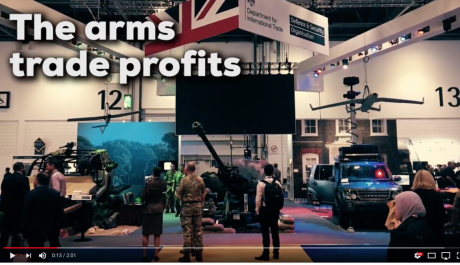 In September 2017, London hosted the Defence and Security Equipment International (DSEI) arms fair, the biggest in the world. 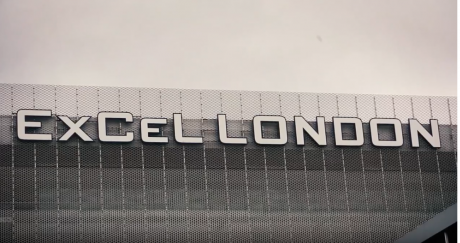 Delegations of military officials and politicians from across the globe descended on the ExCel Centre in London’s Docklands to play pick ‘n mix with the world’s most deadly technology. We were granted a press pass to the DSEI the day before it opened, despite applying several months earlier and repeatedly checking up. The pass came through only after we threatened to publicise the case. The opaque arms industry and the governments that support it do not like journalists or civil society dampening the buying mood. Once inside we saw delegations from nearly every oppressive state in the world walking the air-conditioned halls. At the flagship BAE exhibition, we took a few photos of the Egyptian delegation talking to a stocky BAE official. All the Egyptian military men had obscured their identity badges, but they could not stop us taking photos. In the middle of this, what looked like a British military official, moustachioed and in full officer garb, told us to stop, that we weren’t allowed to take photos. We protested that we had never heard that. He said it didn’t matter. We asked him whom he worked for. “The Defence and Security Organisation,” he replied. We saw that there were other officials with the DSO badge on their breast. Who were they? Why were they working for BAE Systems? The Defence Sales Organisation (DSO) – the predecessor to the current Defence and Security Organisation – was set up in 1966 under Harold Wilson’s Labour government and was part of a significant reform of the Ministry of Defence. There was no great fanfare about its advent but the internal reasoning was that Britain had effectively lost its Empire and was looking for ways to retain “clout” on the international stage. Becoming a major arms dealer was one of the ways to do that. Screenshot: Stop DSEI 2019. Campaign Against the Arms Trade. YouTube.As the Cold War raged, the UK was also losing business to its rivals. The UK share of the world aircraft market fell more than half in the five years to 1964 to just 14%. In this context, a report commissioned by Defence Secretary Dennis Healey recommended the creation of “a small but very high powered central arms sales organisation in the MoD”. It also recommended that the DSO be headed by an arms industry executive, and this has been the case ever since. Essentially the DSO joins arms industry executives and government trade officials in a concerted effort to sell British weapons of war around the world. Despite its controversial position in the UK’s export ecosystem, in 2007, Prime Minister Gordon Brown said he was scrapping the DSO as part of the MOD. The decision was apparently made without the knowledge of BAE - a rare thing in the industry. Gerald Howarth, a shadow defence minister, said at the time: "This is outrageous. DESO [as it was then called] has been responsible for £5bn of British defence exports." But, as Robin Cook said in his memoirs, "I came to learn that the chairman of BAE appeared to have the key to the garden door to No 10.” He added, "Certainly I never knew No 10 to come up with any decision that would be incommoding to BAE." True to this maxim, the body was salvaged and repurposed as part of the Department for International Trade. Nowadays DSO is very visible at arms shows, helping visiting buyers and delegations understand the latest technology offered by BAE Systems and its smaller competitors. It says it offers exporters free support by “company visits ... to [headquarters] in Salisbury to discuss how [we] ... can support you in export opportunities and campaigns,” alongside “impartial military advice ... on products and capabilities to enhance and exploit opportunities in overseas defence and security markets”. The DSO has around 105 staff in London and another 27 members in its export support team. It also has 20 diplomatic posts overseas with the title ‘First Secretary, Defence and Security’. Through the Freedom of Information Act, we gleaned information on where DSO has people stationed throughout the world. It said it had 57 officials, including three people in Japan, Mexico, Canada, South Korea, Turkey, and the largest number, four, in the US. The UK taxpayer pays for three fulltime staff in Mexico City to sell British weapons to a country ravaged by violence. The UK has exported small weapons ammunition, weapon sights and components for rifles, among other things, to the Mexican military. 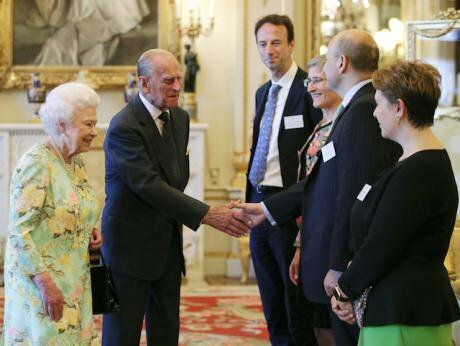 Greeting Louis Taylor, CEO of UK Export Finance, at a reception for winners of The Queen's Awards for Enterprise.Yui Mok/Press Association. All rights reserved. Half of the private sector individuals seconded to the DIT have “strong links” to the arms industry. But the government’s help to the arms industry doesn’t end there. When buyers cannot afford British weapons, the government subsidises loans to them through export credit guarantees. UK Export Finance, which is supposed to back all British exports, says 50% of the support it provides (in the form of loans or guarantees) is given to military exports. UK Export Finance, which is supposed to back all British exports, says 50% of the support it provides (in the form of loans or guarantees) is given to military exports. The British state is set up to deal arms, and its mission has been successful. Britain is a country of 65 million people, and the 21st most populous nation in the world, with the 9th largest economy in the world based on GDP (PPP). But this small island, with very little in the way of an industrial base, has become the second largest exporter of arms in the world. Britain is the go-to country for despots around the world who want to ‘tool up’. Aside from the establishment of the DSO, the key to this is a little-known element of the Thatcher Revolution in the 1980s. The story of Thatcher’s confrontation with the unions and the industries they represented is well known. Thatcher's government emerged victorious and replaced a manufacturing base with the “Big Bang” in the City of London, which drew capital looking for a liberal regulatory environment from around the world. London and the country as a whole is still living with the consequences of this revolution. But Thatcher wasn’t a total industrial arsonist. There was one industry that she promoted to unprecedented levels: the arms industry. During her tenure, the British economy was given a massive boost from the sale of military hardware, and Thatcher spent a large portion of her overseas trips trying to sell British arms to foreign governments. 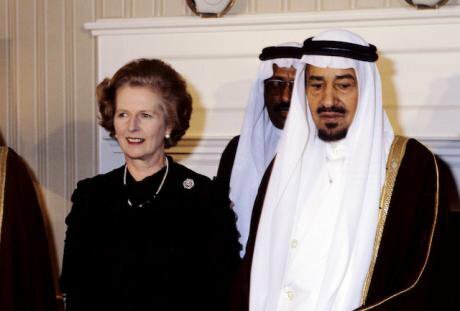 King Khalid of Saudi Arabia with Prime Minister Margaret Thatcher at 10 Downing Street,June,1981. PA/Press Association. All rights reserved.In 1985, for instance, Thatcher negotiated what is still the largest ever British arms deal. The Al-Yamamah agreement would see Britain sell fighter jets, missiles and ships to Saudi Arabia worth £42bn. The deal was, though, riven with accusations of corruption and bribery, the extent of which may be never fully known: two National Audit Office reports on the Al-Yamamah have been suppressed because of “national interest” concerns. Mark Thatcher, Margaret Thatcher’s son, also stands accused of making millions of pounds in “commissions” from the sales. The deal led to Britain pushing ahead of France and Russia as an exporter of arms, behind only the US. Over the past 10 years, the UK has sold over £122 billion worth of arms around the world, 20 per cent of the global total. Thatcher would regard this as an industrial success story. Since the Thatcher era, however, warfare has changed markedly. Technology has changed how wars are fought, while many adversaries have splintered and become uncoupled from states. But Britain has maintained its pre-eminence in the industry, nimbly moving on to dominate the cyber sector and private military sector in turn, thanks both to the relationships and capacities offered by the conventional arms industry and to the light-touch regulatory environment fostered during the Thatcher era. No subsequent government since she stepped down as Prime Minister in 1990 has wanted to restrict Britain’s industries of war and repression from having maximum power on the world stage. But the arms industry and the government’s willingness to champion it has also enabled the UK to become a global hub for companies working on the cutting edge of the new cyber warfare. According to Privacy International, the UK has 104 surveillance companies producing technology for export – to foreign governments and corporations – headquartered in the country. That number is more than double the number of companies of the next European country, France, which has 45 companies headquartered in country. The UK has significantly more surveillance technology companies registered in its borders than anywhere in the world outside the US. This technology is being exported, with government approval, to some of the most repressive regimes in the world. Theresa May meets King Salman bin Abdulaziz al Saud of Saudi Arabia on visit to Gulf Cooperation Council summit. Stefan Rousseau/Press Association. All rights reserved.The UK’s role in the US War on Terror since 2001 has given the war industries another fillip. Many of the private military and security companies (PMSCs) in the UK were set up by former soldiers in the British military who left service after fighting in Afghanistan and Iraq and wanted to make significantly more money in mercenary work. As Dave Allison, chief executive and founder of Octaga, a Hereford-based PMSC, says: “I left the forces after serving time with the parachute regiment and the Special Forces. I saw a distinct gap in providing security to corporate and private clientele, the various big companies out there that were doing it, it was all basically being driven on price, and we wanted to offer them something a little bit different, something bespoke. We cater for various clientele, from television and film industry, to corporate, government, and private high net worth (HNT) individuals, so it’s really broad spectrum of services we do, we do the physical side, the consultation side, and we do the technical side.” He says business has been roaring since they set up in 2001. This combination of learned skills in warfare, liberal regulation, the lucrativeness of mercenary work, and Britain’s global-facing heritage has meant that, today, the UK is the world’s leading centre for PMCS. According to the SiéChéou-Kang Center at the University of Denver, the UK has by far the largest number of PMSCs headquartered in country (199 companies). So this is twenty-first century Britain. 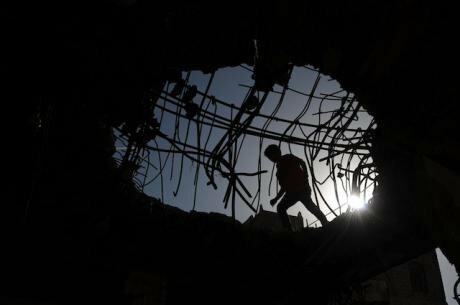 Surveillance system producers, mercenary groups, arms industries are flourishing in the dark. As well as being the financial capital of the world, the UK is right at the centre of the world’s war industry. The latter crown is more embarrassing, so we don’t hear about it, but it has been steadily fostered by successive governments for seventy years. 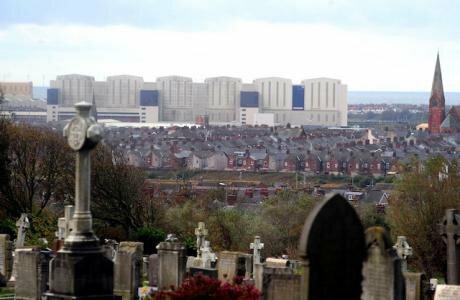 Ground zero for the British arms industry – and all the issues it raises in the country -– is Barrow-in-Furness. While there, we met Norman Hill who has been agitating against nuclear weapons for nearly half a century but it hasn’t dampened his enthusiasm one bit. As we walk along the empty road that runs alongside BAE Systems’ imposing shipyard at the edge of Barrow, the veteran anti-nuclear activist speaks at a hundred miles an hour, wanting to get all the arguments against the industry that sustains his town out as fast as possible. A general view of BAE Systems in Barrow-in Furness, 2010. Owen Humphreys/Press Association. All rights reserved. Hill was born in the town in 1941 and has lived most of his life in the town. “I came from a solid working class family. My dad was an engineer in the shipyard,” he tells us. The Barrow shipyard occupies a central place in the production of what is called Britain’s ‘nuclear deterrent’, producing the submarines which carry the missiles and nuclear warheads. The previous class of nuclear submarines was produced here, as will be the new submarines that will carry Trident. Hill first became involved in the anti-nuclear movement in Barrow in the mid 1970s. There was talk of cruise missiles being deployed in the UK in response to a Soviet build-up the US claimed was a threat to Europe. He thought the idea was madness. Hill’s father worked in the shipyard, but was supportive of his son’s activism. “At that time there were a lot of people in the shipyard who agreed with that position,” he says. Much has changed since then. Crossing the bridge over the Devonshire Dock where the shipyard sits, we see one of the nuclear submarines poking out from under the water. It is hard to fathom that little Barrow, population 69,087, is the central node in the production of a nuclear arsenal capable of wiping out civilisation. “No one really thinks about it like this,” Hill tells us as we take in the scene. Barrow, the biggest town in Cumbria, sits on the outer edge of the Furness peninsula which juts into to the Irish Sea. Half an hour drive north takes you into the tourist hotspot of the Lake District, but Barrow is a world away from there. The shipyard has dominated the town since its inception in the 1870s. 70 miles up the coast is Sellafield, where nuclear waste disposal is a divisive political issue. Atomic Weapons Establishment at Aldermaston, 2009. Wikicommons/ Ivaneol. Some rights reserved.The nuclear warheads are produced and maintained at the Atomic Weapons Establishment in Aldermaston, a town of just over a thousand people near Reading. The site was the end point for anti-nuclear weapons demonstrators who did an annual walk from London in the 1950s and 1960s. The government owns the site, but private sector contractors operate it. The AWE is run by a consortium of three companies (two of them American) – Lockheed Martin, Serco and Jacobs Engineering. The missiles are made in the US and then rented to the UK. 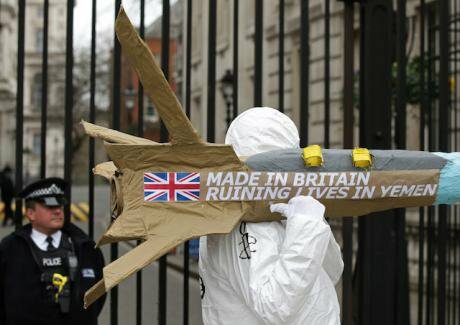 Britain does not own the missiles on which its nuclear warheads sit. Nonetheless, it is considered an ‘independent nuclear deterrent’, though it is arguable that only one of the words in the phrase – nuclear – is true. The Barrow shipyard became part of BAE when Marconi Electronic Systems and British Aerospace merged in 1999. The company dominates the town physically: the shipyard is the first thing you see as you come into the town, eclipsing the rows of one up, one down terraces that line the roads. The company’s logo is all over the town. On one of the main streets in the centre we come across a slab of pavement with BAE’s logo spray-painted on Banksy-style. Up the pedestrianised Dalton Street, which runs to the shipyard from the centre of town, sits a brass monument (paid for by BAE Systems) of workers in heroic poses. ‘LABOUR. WIDE AS THE EARTH’ says one engraving. ‘COURAGE. THE READINESS IS ALL’ reads another. 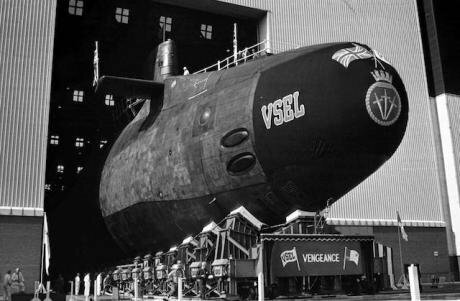 The fourth British Trident submarine, the 16,000-tonne HMS Vengeance, rolled out at the VSEL shipyard in Barrow-in-Furness, 1998. Ian Kershaw/Press Associaition. All rights reserved.BAE has essential leverage over every aspect of Barrow because of the jobs the shipyard provides. If anyone proposes something the company doesn’t like, it can say it will shut down the shipyard. But they do not like visitors. After nearly a year of back and forth, BAE Systems refused us a tour of the shipyard or an interview. Meanwhile Unite and GMB unions, both representing workers in the shipyard, said they could not provide any workers or shop stewards to be interviewed. The secrecy of the arms industry is one its most striking features: the companies and these workers are employed on government contracts, paid for by the public. Unite and GMB were big supporters of Corbyn’s leadership bid while being in favour of Trident renewal to save jobs. Meanwhile Unite and GMB unions, both representing workers in the shipyard, said they could not provide any workers or shop stewards to be interviewed. In the Furness Railway, a buzzing Wetherspoons pub a stone’s throw from the Labour party’s headquarters in the town, locals eat and drink from early in the morning to late in the night. It’s a regular hangout for young lads who work at the shipyard. We sit down with two who are getting in their evening beers. Jack Burns is a 31 year old steelworker at the shipyard, a place it was always his dream to work in. “I always wanted to work in there but I’ve only been working there for the last year. I’ve had a career in office work and computer work but I like to work with my hands plus my grandparents always worked in the yard. In fact, my great granddad died on one of the boats when he worked in there, before - was born.” Everyone in Barrow has a multi-generational connection of some sort to the shipyard. The fear that promises of alternative employment might not be met is understandable. The Thatcher government made similar promises as it destroyed the mining industry, but never replaced the jobs, leaving subsequent generations deprived and destitute. But to many in the anti-nuclear community, Corbyn is valued because he believes in both nuclear disarmament and in protecting workers. “So you’d vote on a single issue on this one?” we ask. This is the sentiment Hill is up against, and it’s pervasive and understandable. British governments have long viewed the arms industry as a key mechanism to boost the British economy. Brexit looks set to be the next stage – after the creation of DSO under Labour and the Thatcherite Revolution – in the arms industry's occupation of the British state. The government claims it has a rigorous export licensing system for its arms exports. Britain has had a defined export licensing process to approve arms sales since 1997, when recommendations in the Scott Report into arms sales to Saddam Hussein were enacted. Arms companies require licences from the DTI to sell “goods, technology, software or components designed or modified for military use” as well as “‘dual use’ goods, technology, software, documents or diagrams which meet certain technical standards and could be used for military or civilian purposes”. But the export licensing system is shrouded in secrecy, with information very difficult to get. In the case of an information request made to the government about surveillance technology sold to Egypt by the UK, further requests were declined because it would “likely prejudice the commercial interests of any companies that may have applied for a licence,” and “would reveal details of the markets that companies are operating in and possibly details of commercial opportunities that are still available.” With this proviso many information requests are turned down. British arms export 'controls' seem more about facilitating exports than restricting them. The licensing system still allows half of all UK’s arms sales to go to the dictatorship of Saudi Arabia, currently undertaking a brutal bombing campaign in Yemen, using British-supplied warplanes and missiles. Since 2008, the UK has sold £10.8bn of weapons to the Saudis, by far the biggest market for UK companies. The British government has rejected repeated calls to halt arms sales to Riyadh. Amnesty International protesters carrying five giant dummy missiles to Downing Street, March 2016. Yui Mok/Press Association. All rights reserved.In some conflicts, the government just does not know if its weapons are being used. Earlier this year, Turkish military forces intervened in the mainly Kurdish-controlled province of Afrin in northern Syria, in an operation widely criticised by human rights groups. In answer to a parliamentary question, the British government stated: “We cannot categorically state that UK weapons are not in use in Turkish military operations in Afrin”. Another major problem is that, as the government admits, “We do not collect data on the use of equipment after sale.” It is hard to see how this is consistent with government claims that it operates a 'responsible' arms export policy. The same government department set up to promote and facilitate arms exports is meant to regulate them, too. Licences are provided by the Export Control Organisation (ECO), which is part of the DIT. And it shows. Levels of sales of British arms to countries around the world often correlate with an uptick in violations of human rights norms in those countries. The majority of British arms go to the Middle East, particularly the Gulf region. In the aftermath of the Arab Spring when authoritarian governments cracked down on protest movements and dissent, the British government did not blink. Arms continued to flow, in fact, in nearly all cases the increased demand was met by more British arms. Countries where repression has deepened in recent years, such as Egypt, Israel and Bahrain, remain significant recipients of British weapons and military equipment. The problem is not just that British equipment might be used to crush legitimate dissent; it is that the supply of weapons to security forces sends an overall message of support for what they are doing. It can also enhance the international legitimacy of repressive states and reduce the political space for opposition forces to challenge them. BAE Systems is the jewel in the crown of the British arms industry. Other significant companies in the country include Rolls Royce, Babcock, Serco, Cobham, QinetiQ, Meggitt, but BAE is in a class of its own. A large majority of UK arms procurement goes straight into the coffers of BAE. Through an FOI we submitted, we discovered that the UK consistently awards contracts worth over $3bn a year to BAE Systems - around 10% of its total outlay. BAE, actively involved in the Yemen war as a supplier of aircraft and technical military assistance to the Saudis, made profits of £792m in the first half of 2018. BAE's profits are very important to the UK government, which is a key reason it maintains such a close relationship with Saudi Arabia, which has 6,000 BAE staffers in the country, according to the Labour MP, Graham Jones, who we met in Portcullis House. Jones was recently appointed chair of the Committee on Arms Export Controls in Parliament. In our hour-long meeting, he spent considerable time defending Saudi Arabia’s record in Yemen, and insisted there was no evidence British weapons had been used in atrocities. He said he had a very strong aversion to the reporting of NGOs on the situation in Yemen. It is hard to know the extent of lobbying by BAE in the UK, but in the US things are more transparent. In trying to drum up business in the US, BAE has put a lot of money into its lobbying operation in Washington DC. According to records, Podesta Group, which is now under investigation in the Russia-Trump inquiry, received most money from BAE in 2017. Through the FOI, we obtained recognition that it had been “established from the records ... that BAE Systems did once form a part of a business delegation that accompanied the Prime Minister and the Secretary of State for International Trade on a visit to India in November 2016.” This was Theresa May’s first bilateral meeting since becoming Prime Minister. May said: “The UK and India are natural partners – the world’s oldest democracy and the world’s largest democracy – and together I believe we can achieve great things – delivering jobs and skills, developing new technologies and improving our cities, tackling terrorism and climate change.” Securing contracts for BAE Systems was obviously a large part of this. 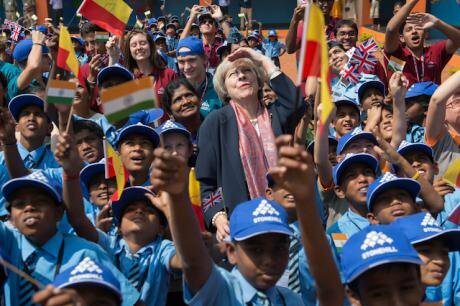 Theresa May watches a flypast by the Indian Air Force in Bangalore on a trade mission paving the way for close commercial links with India after Brexit. Stefan Rousseau/Press Association. 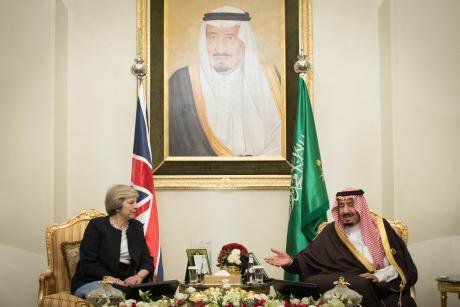 All rights reserved.We also requested the FCO briefing notes for Theresa May's April 2017 visit to Saudi Arabia. After being kept waiting for eight months, we were told they came under a national security exemption. A lengthy discussion had obviously taken place inside the department. There is a revolving door between the MOD and DTI and the arms industry. Through another FOI request, it was revealed that in one year, from 2006 to 2007, 36 former employees of the MOD applied to join BAE Systems. These employees use the knowledge gained from MOD to earn bigger sums in the private sector, and may end up back at DSO. BAE is heavily involved in many centres of learning in the UK, making it indispensable to young engineers getting an education. BAE is heavily involved in many centres of learning in the UK, making it indispensable to young engineers getting an education. The company has partnered with Cranfield University to boost Britain’s engineering skills through a new post-graduate engineering apprenticeship programme, which will provide learners with a valuable Masters-level qualification. Richard Hamer, director of education and skills at BAE Systems, said it was part of the company's "on going commitment to nurture talent and high-end skills.” Britain’s top universities have received at least £83m worth of funds during 2014-17 from firms involved in the arms trade. Unions are also a very powerful lobby for the arms industry. By making the Eurofighter Typhoon aircraft and Britain’s nuclear submarines, BAE employs 34,600 people in the UK, out of 83,100 worldwide. Workers from BAE Systems recently travelled from across England to the Houses of Parliament to lobby MPs and demand that the government “takes back control of Britain’s defence capability and spends the UK’s defence budget to support jobs in Britain rather than in factories overseas”. The lobby was organised by Unite, the UK’s largest defence union, following plans by BAE Systems to cut nearly 2,000 jobs. The cuts, which will see significant job losses in Typhoon and Hawk aircraft production as well as RAF base support and at BAE’s marine division, came amid warnings that nearly 25 per cent of the UK’s military spending will benefit US factories and firms such as Boeing by 2020. Military industry in the UK is made up of close to 2,500 companies, generates £33.5bn in turnover and employs 128,000 people, according to the government. Yet even from this high base, the government is currently seeking, in effect, to further militarise the British economy and society. The 2015 Strategic Defence and Security Review was the first time the UK officially recognised promoting prosperity as a national security task. Ministers have said that "Strategic exports are now a core activity for the Ministry of Defence so we are calling on companies to play their part in increasing defence export sales and attracting inward investment into the UK". Screenshot: Stop DSEI 2019. Campaign Against the Arms Trade. YouTube. The government's new Defence Industrial Strategy, announced last December, and its new Combat Air Strategy, announced earlier this year, both envisage deepening UK industry's reliance on the military sector for jobs and growth. The government's new Defence Industrial Strategy, announced last December, and its new Combat Air Strategy, announced earlier this year, both envisage deepening UK industry's reliance on the military sector for jobs and growth. Indeed, the government has recently come to a stunning but little-noticed conclusion about its industrial strategy, saying that "British prosperity relies on defence". A government-commissioned review of defence’s contribution to national economic and social value, released last month, concludes that " defence and the defence industry reaches every corner of the UK and is central to employment in so many cities and towns" but that more can be done to promote its role in promoting the UK's technological future. But is Britain's military-industrial complex truly in the public interest? Could the 26,000 highly skilled researchers, designers and engineers currently working in the military sector be better deployed elsewhere? Jeremy Corbyn has called for a Defence Diversification Agency and has said in the event of non-renewal of Trident that investment would save all the jobs and put people to work in other high-skilled socially-useful industries such as renewable power. Research shows that when evaluated on a cost-per-job basis, jobs in the arms industry are more costly than nearly every other sector. A University of Massachusetts study concluded that, if the US government invested $1 billion in alternative civilian sectors rather than on military production, it would generate up to 140% more jobs; $1 billion military spending was found to create 11,200 jobs whereas education spending creates 26,700 jobs and health spending 17,200 jobs. 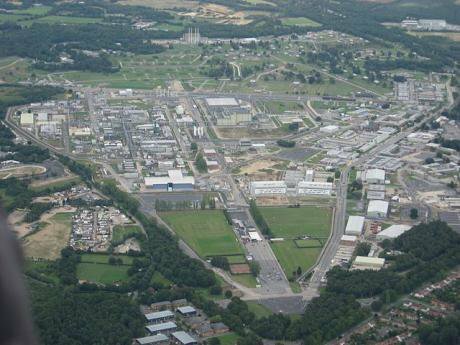 A recent report by the Nuclear Education Trust in the UK calls for the development of a defence diversification strategy, something that UK governments have never formally championed. The report does not pretend diversification will come without costs in terms of some jobs losses. But it notes that employment in military manufacturing is anyway falling. The number of jobs in the arms industry is less than a third of the level in 1980 (then over 400,000) - a long-term decline substantially due to the increasingly capital-intensive nature of the work carried out in the UK, automation and globalised supply chains. By contrast, employment in 'new' industrial sectors is rising and could benefit from a broad arms conversion programme. For example, the German renewable energy industry already employs 380,000 people and this is expected to rise to 600,000 by 2030 as the country increases the proportion of electricity generated from renewable sources. Unite, which has persistently called for defence diversification and backs Corbyn's support for defence diversification, notes that legislation is needed to create a statutory duty on the Ministry of Defence and its suppliers to consider diversification. "Without legislation, history tells us that voluntary mechanisms do not work, as defence companies are unwilling to take the risk of entering new or adjacent markets", Unite says. If the case for diversification is strong, why have successive UK governments not taken it up? One reason is certainly due to the short-term upheaval in some areas where military industry is important. But there is a more generic issue: the British military-industrial complex is seen by senior military and political figures as an essential part of the UK's military role in the world. The UK's two new aircraft carriers, being built at a cost of over £6 billion, don't just create British jobs, they will “transform the Royal Navy’s ability to project our influence overseas”, the government has said. Indeed, the plan is for these carriers to deploy “in every ocean around the world over the next five decades”. The new platforms are appearing to take Ministers back to the glory of days of empire in what the Head of the Royal Navy, Admiral Sir Philip Jones, has called a "new era of British maritime power". To add to their new bases in the Gulf, military chiefs are now also talking about projecting power beyond the Middle East to the Indian Ocean and beyond and considering setting up new bases in South East Asia. Does this enhanced global military strategy have public support? It is hard to say because it has been so little debated. Here is where we come back to promoting UK commercial interests – with the addition of a small matter called Brexit. In a speech to an audience in Washington in 2016, Admiral Jones said: "Now that our Government seeks to extend the UK’s economic partnerships post-Brexit, the Royal Navy stands ready once again to be melded and aligned for best effect with our nation’s growing global ambition". Jones says that to promote UK commercial interests, the Royal Navy must have a "formidable presence on the global stage" especially given Britain's dependence on the sea for imports and exports. So Brexit is driving UK leaders' new military ambitions. Or perhaps providing an easy cover for their ambitions. Either way, the whole strategy raises concerns. Does this enhanced global military strategy have public support? It is hard to say because it has been so little debated. The public is surely even less likely to support future entanglement in wars in Asia than it does Britain's current wars in the Middle East. What is clearer is that Britain needs an industrial strategy that makes the economy less dependent on the military and arms exports and which articulates a transition towards creating new, civilian jobs for large numbers of people. But at the same time, Britain surely needs to move away from its imperial pretensions to police the world's oceans. The two factors are likely to be become ever more interlinked in post-Brexit Britain. Support for this article was provided by Action on Armed Violence and the Pulitzer Centre for Crisis Reporting.